Hapoel Haifa (National League) added to their roster 31-year old American guard Jahmar Young (196-86, college: New Mexico State). It is actually his comeback to Haifa as he has played here before. Young played last season at Al Gharafa in Qatari D1 league. He managed to play in three leagues last year. Young also played for Beirut Club (LBL) in league where in 6 games he recorded very impressive stats: 18.5ppg, 3.7rpg, 2.0apg and 2.0spg. Young also spent pre-season at Cibona in Croatian league that year. 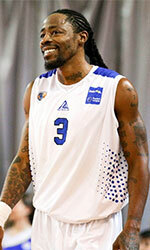 In 5 ABA League games he averaged 9.6ppg, 2.6rpg, 2.4apg and 1.0spg. The list of the past achievements is quite long as among others Young won Lebanese League championship title in 2016. He was also voted Eurobasket.com Latvian League All-Imports Team back in 2012. Young is quite experienced player. Thanks to his pro career he managed to play on four different continents (Europe, Asia, Latin America and of course North America) in eight different countries. Young has played previously professionally in Belgium (Spirou Charleroi), Bosnia (Siroki Primorka), France (Levallois and Entente Orleans 45), Russia (BC Nizhny Novgorod), Serbia, Latvia (Ventspils), Lebanon (Al Riyadi and Al Moutahed) and Dominican Republic (Huracanes del Atlantico). He attended New Mexico State until 2010 and it will be his ninth season as a professional player. The scouts decsribe him following way: Jahmar Young is a 6'5" silky smooth shooting guard who is versatile enough to play the 1, 2 and 3 positions. A NBA like talent. A quick to the basket player which makes him difficult to contain only because he shoots the long ball so well. An enthusiastic defender who enjoys his teammates. Very coachable player.